Neill Blomkamp took Hollywood by surprise in 2009 with his independent Sci-Fi thriller Distict 9. The film, which starred Sharlto Copley, was based on his 2006 short film Alive in Joburg. The $30 million dollar indy flick, produced by Peter Jackson, would go on to make $210.8 million worldwide and score a 90% out of 261 ratings on Rotten Tomatoes. Needless to say, Blomkamp has a tough act to follow with his big(ger) budget summer action film Elysium. More Elysium reviews by Jeremy and Nick. Max (Matt Damon) is an ex-criminal on parole, working hard to survive a life of poverty in 2154 Los Angeles. To put it in current terms, the wealthiest 1 percent of the population have abandoned Earth to live on a futuristic space station (based on an actual concept called a “Stanford Torus” created by NASA in 1975) called Elysium. There the inhabitants live in a utopia where the air is pure, and any illness or physical disability can be cured using a medical machine available in every household. 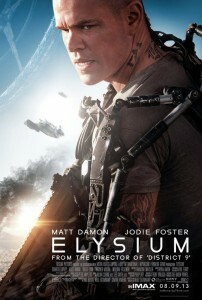 It is Max’s dream to one day pay his way to Elysium, and fulfill a promise to his childhood friend Frey (Alice Braga). Unfortunately after taking a lethal dose of radiation at work, he is given only five days to live. With his only hope of salvation residing high above the sky, he takes on a job to kidnap wealthy businessman John Carlyle (William Fichtner) and use his resources to get there. Little does Max know that Elysium’s Secretary of Defense (Jodie Foster) is staging a coup to take control, and Carlyle is holding the key. He is forced to deal with her undercover special forces agent Kruger (Sharlto Copley) while doing his best to stay alive before his time runs out. Matt Damon has more than proven his ability to star in action films, thanks to the Borne Trilogy, and does a fantastic job in the lead role of Elysium. Although his character is that of an ex-con, it is hard not to be affected by the charisma he exudes. We form an instant connection with him, only to have our hopes of him making it shattered by the news of his affliction. There is no doubt that Damon can act, and it truly shows as his character suffers through a job he has no choice but to take. All of his action training pays off, particularly toward the end of the film, as he fights his way through Elysium. Sharlto Copley is the cat to Damon’s mouse throughout the film. As much as Damon commands the screen, Copley is right there with him. He plays a twisted, sadistic villain who has everything to lose if he can’t track down the data that Max has. If it were any other actor, Copley’s performance may have seemed way over the top. But instead it is nearly impossible to take your eyes off his menacing performance. After seeing his fantastic performance in District 9, which was his first feature film, it was clear that he was an actor to watch. It is great to see him playing such a large role in a film of this caliber, and it can only mean that we are going to see a lot more of Copley in the future. After seeing him play the bad guy here, I can’t wait to see him as the villain in the upcoming Oldboy remake. One of the best parts of District 9 was how well the visual effects blended in with the live action. Blomkamp enlisted Image Engine to compile 311 shots for his last film, including many 100 percent digital elements that seamlessly blended in with their surroundings. It is evidenced by his earliest work that he has an incredible vision for making Sci-Fi elements appear real, and that is exactly what he does once again with Elysium. His unique style shines as he applies it to everything from the spacecrafts and defense droids, to the absolutely beautiful creation that is Elysium. The lighting and textures make all the difference, giving the film a distinct feel that we have come to know and love from the director. Image Engine, who has worked on recent films like Battleship and Zero Dark Thirty, is the lead on effects once again and does not disappoint. There were a few rather strange ADR (Automated Dialogue Replacement) issues, especially for a film of this caliber. Most noticeable was a scene early on where Jodie Foster is speaking to the president of Elysium, and it’s basically a close-up of her face. Foster puts on a peculiar accent in the movie, something of a mix between Southern and French, which may be why it was hard to match up her movements with any re-recordings. Overall the sound mixing was incredible throughout the film, so it is a shame that some of the ADR wasn’t as good. Nothing to ruin the film, but noticeable enough where it will make you check out your equipment if you aren’t aware of it. For a summer full of gigantic blockbusters, Elysium is the movie we have been waiting for. With as big of a scope the film has, it kept to a rather modest budget at $115 million dollars – which is small by today’s standards. Much like District 9, as well as many science fiction works, the film is an allegory for the real-world problems our planet faces today. However, Elysium never feels too heavy handed or like it is shoving its politics down your throat. The action and visual effects are excellent, coupled with terrific acting and direction, making it one of the must see films of 2013. Read Jeremy Housewright’s review of Elysium on Page 2.